Dr Maria Vogt is Professor of Chemistry at Bloomfield College in New Jersey where she teaches lectures and runs labs in Organic Chemistry and Biochemistry. Having had a prior research career and publishing more than 45 papers, Dr Vogt now devotes her efforts to prepare students for the “real world” by exposing them to as many hands-on and instrumental skills as possible prior to graduation. She encourages the development of problem-solving skills. NMR spectra are used as “puzzles” through which the students are pushed to use their brain to figure out unknown samples in their practical classes. Undergraduate chemistry major, Tytianna Drew, uses the Magritek Spinsolve benchtop NMR spectrometer in her organic chemistry classes. 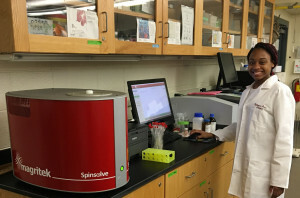 Her college laboratory experience has earned her a summer internship at global biopharmaceutical company, Celgene Corporation, headquartered in New Jersey.